The Vitreus is a Boss from Zelda: A Link To The Past and guards the sixth maiden in the Misery Mire dungeon. 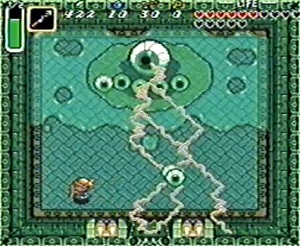 This boss is similar to Arrghus / Wart but Link can attack all the small eyes this time with his sword. 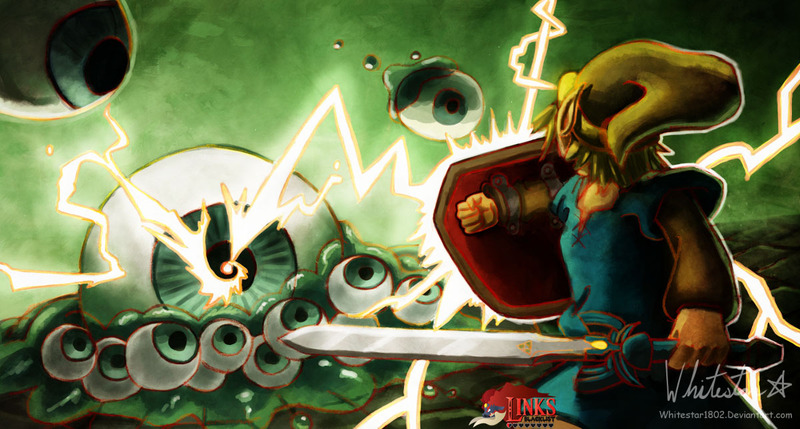 After the many small eyeballs are down, the big one will attack Link faster than before with lighting strikes which can not be blocked. It is relative easy to defeat it using the bow but sword strikes can be used against Vitreous as well. Our first illustration of Vitreous was submitted by Whitestar1892, an 18 year old (May 2013) artist who continues to draw one awesome art after another! “My contribution to “Link’s Blacklist”, an awesome project at Game-Art-HQ.com to draw every boss from the Zelda series! I volunteered to paint Vitreous because I adore ALttP and this guy needs more art. I mean c’mon, it’s a giant eyeball that tries to kill you with lightning and smaller eyeballs. It just screams old school boss. So, this took a bit longer than intended. I decided to try sketching the lineart in pencil, which lost me a whole day, but I like the texture I ended up with. I wanted to keep some of the watercolor feel of the ALttP artwork, but I think in the end I failed. Vitreous himself could’ve used more work too but…well, he’s a giant eyeball that wallows in his own poisonous eye goo. I can only make him look so attractive.